The competition to design a new bus for London is now closed. Winners will be notified at the end of October or in early November. The results will be revealed here shortly after, so watch this space for further announcements. Morris Hickey, former Chairman of the Redbridge Public Transport Liaison Committee, Cabinet Member for Highways and Deputy Leader of the Council suggests…. UPDATE: The Ilford Recorder report on a local [Seven Kings] man's design for a 21st century Routemaster, which is among 255 shortlisted for consideration. 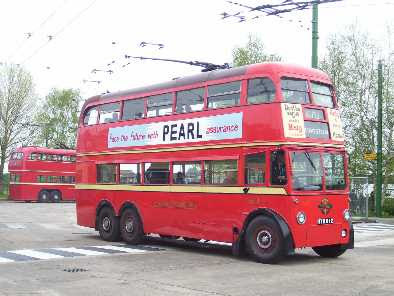 This is one of 127 post-war trolleybuses introduced in London between 1948 and 1952. They had registrations HYM 765 to HYM 841, and LYH 842 to LYH 891. They carried fleet numbers 1765 to 1891 corresponding to the registrations. They largely replaced London's first trolleybuses introduced in 1931. After the replacement programme began in 1959, 88 of these new vehicles were sold to various Spanish undertakings, and 16 went to Bangkok. I saw some of them in April 1965 in Zaragosa where I was attending the second leg of a semi final of the European Cupwinners Cup. The photographed vehicle, 1812 (HYM 812), spent much of its time working round the Kingston/Hampton Court area but was also the last trolleybus to enter Hanwell Depot in November 1960 operating the final journey on route 607 from Uxbridge. It was sold in 1961 to Santander, and brought back to England in 1977 after purchase by the British Trolleybus Society. After a long restoration programme it made its inaugural museum run at Sandtoft on 28 May 2001. It can be seen operating there, and on special occasions ag the East Anglia Transport Museum at Carlton Colville. I saw 1812 at Sandtoft in August 2006, although not actually operating that day. Ah, those were the days! Trolleybuses had acceleration that left your stomach behind, far faster than modern buses. And the skies over Fullwell Cross and Ilford were spiders webs of wires. Conductors used long poles to transfer the electrical hookups from one route to another or to return them when they became disconnected. Health and Safety probably wouldn't allow conductors to wield such poles today. Why did we abandon those green machines in favour of filthy diesal engines that spew out clouds of fumes you can taste in the air? Yup, I remember Trams in Holloway Road Islington where I grew up. My Dad was always getting his bicycle wheel trapped in the grooves. I also recall the Trolley buses, but they must have been quite late and didn't last long at that location, for when I started work in 1965 they had definitely gone and we had RTs and possibly RMs. At one Museum in East Anglia, I forget which, I encountered the original Organ [Wurlitzer] from the Boleyn Odean adjacent to Upton Park Football Ground. In those days I was living just down the road. That would be at Thursford I think. As to 1965 and trolleybuses, the last ones ran on routes 601-605, 657, and 667 on 8 May 1962. Oh, let's join in this nostalgia fest - I recall the trolley buses in Clapton in the 50's; time and again they would take a wide bend near Stamford Hill just a bit too fast, and off would the hookups. Can you imagine modern traffic piling up in a docile fashion behind as the conductor got out the long pole and jabbed at the wires! No worse than Barkingside High Street is now! There are far more efficient systems than the primitive one used in London for retrieving trolley booms and reconnecting them to the current wires. Dewirements occur mostly through bad driving rather than inherent faults with the system design. The fact remains that these were (still are where they operate) mass transit vehicles that emit zero emissions at the point of oepration, unlike the ubiquitous diseasel bus. Oh, it was much better in Clapton than Barkingside High St is now - after all, most of the proles didn't have cars! Yes Judith, and since we are on nostalgia, Holloway Road was and is the A1. Back in those days the lorries would come down the road in the early hours to deliver stuff to the London Markets. But on a Sunday the road was deserted, of traffic that is, and we had Brass Bands marching up and down the road. "Run down and badly in need of a face lift" (Deputy Leader of the Council, September 2007). It appears she was describing Barkingside High Street, and was introducing a cabinet report about the regeneration of Barkingside High Street. Fourteen months later nothing has happened. They are still scratching around for the money. Some of the current Redbridge cabinet members are like a collection of gun dogs. They sit on their backsides and bark, but do precious little else. I do believe that Morris’ misspelling was deliberate. It was - anybody reading it carefully will understand the point. WE RECENTLY HAD CAUSE TO RIDE ON A WONDERFUL OLDE ROUTE-MASTER BUS TO TOWER BRIDGE. WILL THESE NEW BUSES HAVE THE OLDE ROUTE-MASTER SUSPENSION RATHER THAN THE PRESENT THROW-EM-ABOUT-ALL-OVER-THE-PLACE SUSPENSION OF MODERN BUSES AFTER THE ROUTE-MASTER? And whilst we're about it, could all London Taxis be black please? And could adults be addressed as Mr and Mrs, not Mary and John, by strangers working for the NHS, insurance companies, complaints depts etc? And could adult cyclists stop riding on the pavements (nearly got knocked over this afternoon)? And could other adults stop walking around sucking at water bottles like great big babies? And don't call me Ms or darling or I flip! Monsieur Morris can get away with murder, (figuratively speaking)! Mamzelle, or any reference to Armentieres and I double flip!